AUDCHF is not a pair that often features in most traders' considerations, but it may well be setting up for a nice move soon. The weekly chart below shows a downtrend that has accelerated over the past year, as evidenced by the steeper trend line. Although there is almost certainly divergence regardless of which indicator is used, even a single weekly candlestick downwards could potentially yield 150 pips or more. Given how long this trend has been in force, it is certainly wiser to go with the downward flow rather than bet against it. The daily chart below shows an even more optimistic picture, as AUDCHF is currently testing resistance and there are approximately 300 pips between the current price and the previous low. As with all “bounce-or-break” scenarios involving trend lines, it is far wiser to assume that the trend is still intact, and that makes this an excellent short set-up. The four-hour chart is most forthcoming with regard to support and resistance. Previous horizontal levels from a consolidation zone have just come into effect for this trade and are likely to provide a potential turning point. The key resistance zone is defined as 0.8050-0.8141, but mildly disturbing about this zone is that it is 91 pips wide, which is close to a day's average true range for this pair. Thus, more conservative traders may actually prefer to take a trigger off the four-hour chart. The risk would be somewhat larger (most likely in the 30- to 40-pip range), but given the potential for 300 pips or more, this would hardly be a problem. This is actually the best way to trade this set-up. 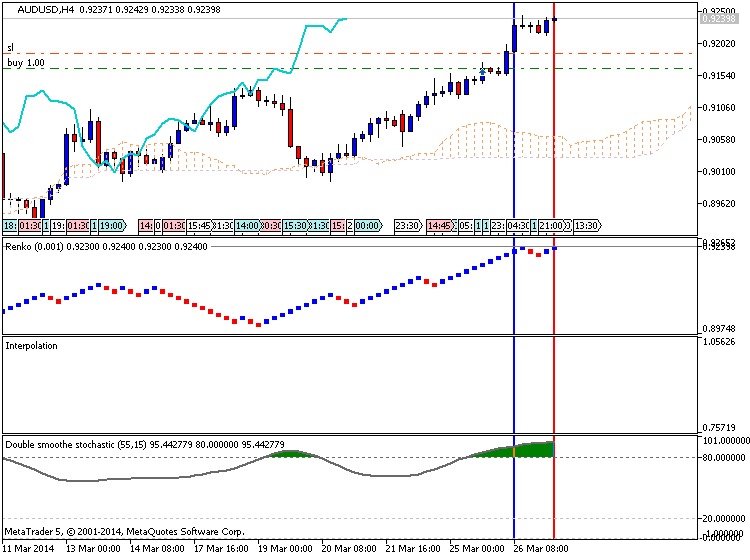 It is also possible to trade it on an hourly time frame, with only some modifications. The recent momentum that has caused price to barrel into the resistance zone is cause for concern. Thus, an additional level of resistance has been estimated using the Fibonacci expansion tool. This provides a smaller resistance area (0.8090-0.8134) within the larger zone, but given how close the top is to the larger zone, the final preferred risk zone is 0.8090-0.8141. This zone is only 51 pips in depth, which is acceptable on the risk side of the equation. It is worth noting that by targeting a smaller resistance zone, the trade may actually miss triggering by just a little before shooting down, but that is a trade-off that more conservative traders must accept. Aggressive traders, on the other hand, could still use the original blue box on the hourly chart, provided they are extremely defensive in their trade management. Trades on both time frames may be initiated using bearish reversal divergence, pin bars, and/or bearish engulfing candlesticks as triggers. Two or three attempts should be made to get onto the move. The interesting thing about this set-up is that there may actually be a case for more highly skilled traders to enter scalps off the white box on the 15-minute chart (not shown). Less-experienced traders should stay away from this approach, however, as it requires expert trade management. Head-and-shoulders patterns tend to generate a lot of excitement among traders. However, there are a few factors that can cause these popular patterns to fail, especially if they are entered too quickly. AUDCAD is currently exhibiting one potential example of this situation. As shown below, the rising wedge pattern on the AUDCAD daily chart signals a rather weak uptrend in the bigger picture, but it has not yet shown any of the usual wedge pattern breakdown signals. The most telling signal would be a quick move beyond the upper wedge resistance before breaking back in again swiftly. Since it has done no such thing, this pattern can be traded using traditional support and resistance principles instead. The head-and-shoulders pattern on the below AUDCAD four-hour chart will become obvious once the neckline denoted by the black horizontal line has been drawn. However, less-experienced traders might easily miss the fact that this pattern will have to punch through at least three levels of rising support in order to achieve its goal. In addition, this goes against the dominant trend on the daily chart. This is not impossible, of course. However, a far more likely short-term development would be a bounce off one of these rising lines of support, which is why today's trade is to the long side. The hourly chart below clearly provides a reasonable support zone for initiating new longs. The exact zone comes in at 0.9849-0.9882. This risk zone is a mere 33 pips deep, as compared to the 60-100 pips that even a conservative move to retest the recent highs would supply. Nonetheless, in order to achieve greater precision with this trade entry, the 15-minute time frame (chart not shown) is preferred. Viable triggers would include the usual suspects, including bullish reversal divergence, pin bars, and/or bullish engulfing patterns on the 15-minute chart. Dropping down to the lower time frame should provide even narrower risk, however, traders should be willing to take two or three tries to get in on this move. Although this is essentially an intraday trade, part of the position can be scaled out and the remainder left to ride what could be a worthwhile move amid acceptable risk. There has been no question that the Australian Dollar is trading in a long-term downtrend against the US Dollar since the pair broke below the 2.5 year low in June of 2013. AUD/USD then continued to set new 3-year lows in January 2014, but only after posting a healthy 50% pullback of the original move lower. However, with a second pullback of the downtrend underway, traders must now consider if and when to enter the possible continuation of the downtrend. Looking at a daily chart, we see that when the Aussie broke out of the second leg of the downtrend, the pair continued to trade in a less shallow downtrend around the start of the New Year. But that down trend was also broken earlier this month, when a period of sideways trading unconvincingly brought the pair above the upper channel. AUD/USD continues to trade above the upper trend channel, the pair tested and failed to break above the 2-month high at .9086, which may scare traders away from trying to place bets on AUD/USD rising further. On a 4 hour chart below, we also find an upward trend line from early February that may continue to provide support, and the 2-month high at .9086 in January may continue to provide resistance. Traders looking to short the Aussie against the greenback should wait for a convincing daily close below support by the upward trendline, while those expecting a further pullback to the long-term downward trendline from the weekly chart should wait for a daily close above the January high. The Australian Dollar continued to push higher against its US counterpart for a fourth consecutive day, taking out resistance at 0.9177 marked by the 38.2% Fibonacci expansion. The bulls are now testing the 50% level at 0.9233, with a break above that eyeing the 61.8% Fib at 0.9290. Alternatively, a reversal back below 0.9177 aims for the March 7 highat 0.9132. Prices are too close to relevant resistance to justify a long position from a risk/reward perspective. On the other hand, entering a short trade looks premature absent a new bearish reversal signal. We will continue to stand aside for now, waiting for a more attractive setup to present itself. The Australian Dollar continued to advance for a third consecutive day against its US namesake hitting the highest level in five months. Buyers are now testing the 50% Fibonacci expansion at 0.9412, with a break above that on a daily closing basis exposing for the 61.8% level at 0.9461. Alternatively, a reversal below the 38.2% Fib at 0.9363 targets the 23.6% expansion at 0.9303. The available range between near-term support and resistance is too narrow to make for an attractive trade setup for a strategy using a stop-loss activated on a daily closing basis (as is the case for our approach) given a 20-day ATR reading of 70. We will remain on the flat for now. One of the more popular strategies for end-of-day trading involves the pin bar, which many use to great effect. However, today's intraday trade actually highlights a pin bar breakout on the AUDJPY daily chart that may not work out as well as longer-term traders may hope. As shown below, the pin bar high has just been broken on the daily chart, and price appears to be happily on its way. However, there are two clear horizontal ranges in play on this time frame, and price is about to retest a roof. It may or may not break to the topside from here, but intraday traders could take their chances with countertrend trades here nonetheless. If price reacts—and recent candles have reacted to this level many times—then there is at least potential for a scalp here, one that could turn into a longer-term trade if price heads lower. There are 70 pips to be had even to reach the rising trend line below, and if it breaks, it would signify a shift in the somewhat dubious-looking uptrend comprised of many overlapping swings. The lower portion of the resistance zone on the four-hour chart (see below) is obvious, as it is simply the level that has recently held as resistance. To provide some room for error, a value approximately one-third of the current horizontal range has been added to the topside, giving an overall resistance zone of 95.18-95.47. This zone is 29 pips deep, which is a little large compared with the (conservative) potential 70-pip move to the trend line. As a result, the better idea would be to trade this set-up using a trigger from the hourly chart, shown below. There are a lot of overlapping moves here, which suggests that the current upward move is being consistently challenged by sellers and is most likely not a trend move. With that in mind, once AUDJPY touches resistance, short entries could be made using bearish engulfing patterns, pin bars, and/or bearish reversal divergence on this hourly time frame. As always, however, two or three attempts may be needed in order to successfully hop on to this move. The Australian Dollar looks vulnerable to deeper losses after prices broke below support at the bottom of a rising channel set from late January. Sellers now aim to challenge the 23.6% Fibonacci expansion at 0.9201, with a daily close below that exposing the 38.2% level at 0.9041. The channel floor, now at 0.9358, has been recast as near-term resistance. A move back above that initially targets the May 14 high at 0.9408. We will now enter short in line with our fundamental outlook, aiming for 0.9201 as an initial objective. A stop-loss will be activated on a daily close above 0.9408. 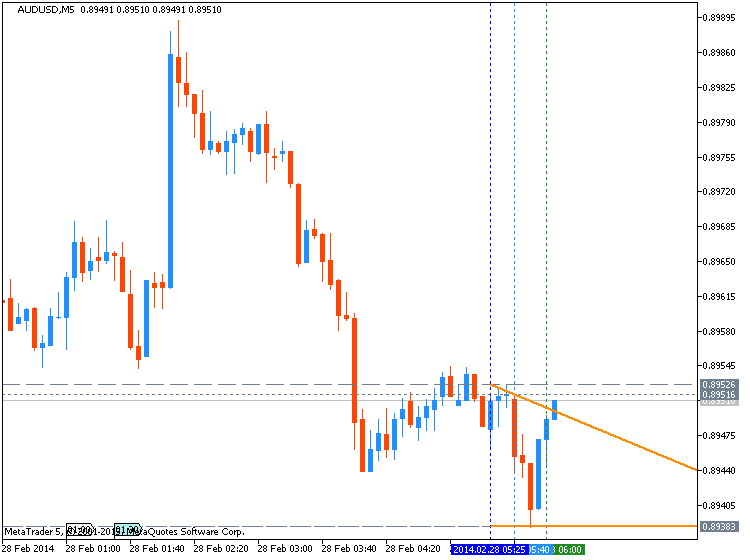 We will take profit on half of the trade at the first target and trail the stop-loss to the breakeven level. 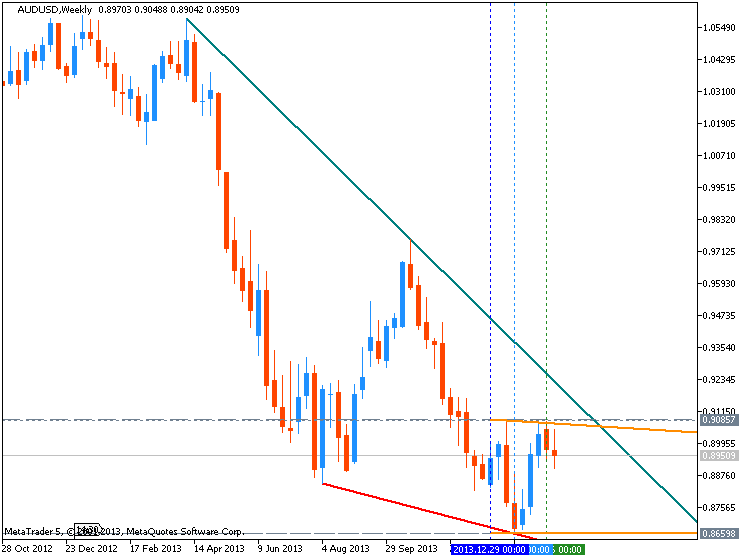 AUD/USD is awaiting guidance near the 0.9320 mark with candlestick reversal signals lacking on the daily chart. This suggests the pair’s consolidation beneath the 0.9440 level of resistance may be set to continue. Examining the four hour timeframe; a Harami pattern suggests the bears may be relinquishing their grip on prices in early European trade. The formation could hint at a push back to 0.9440 if confirmed by a second up-period and break above intraday resistance at 0.9360. AUD/USD continues its consolidation between the 0.9320 and 0.9440 mark with a Doji on the daily suggesting indecision amongst traders. The pair could remain range-bound in the absence of key reversal candlestick patterns. Examining the four hour timeframe; a Harami pattern as noted in yesterday’s report yielded an intraay recovery for the Aussie. 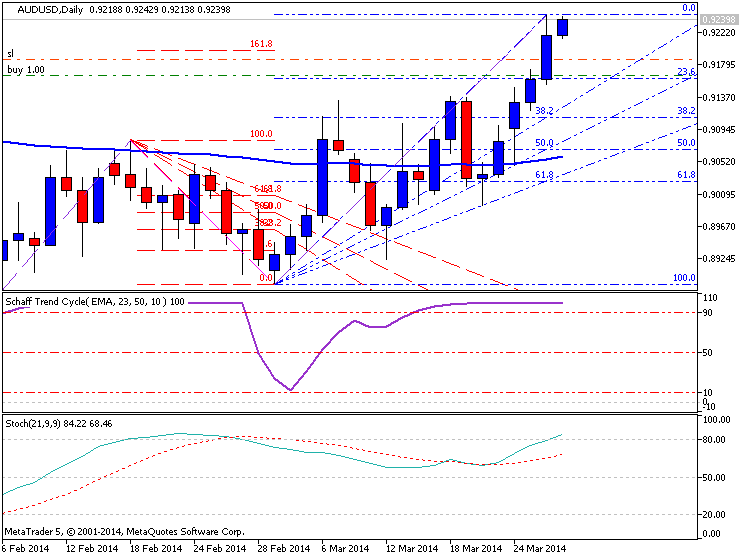 With the pair holding above the 0.9360 mark a run on 0.9400 may be possible with bearish patterns lacking.